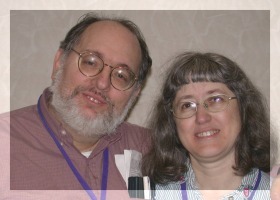 Mark and Evelyn Leeper in 2002. Photo by Mark Olson. By Bill Higgins: 1978 was a good year for me and, apparently, a good year for starting fanzines. Congratulations on celebrating File 770‘s fortieth anniversary! And last Friday I noticed that Issue Number 1998 of MT Void had slipped into my mailbox. Which means that Evelyn and Mark Leeper are scheduled to publish the two-thousandth issue on February 2, 2018. We have had some questions about the Mt. Holz Science Fiction Society and the MT Void. Let me try to answer all the questions in one very short history. Since we first met Evelyn and I have always mixed out interest science fiction with our socializing. We were in the science fiction club at the University of Massachusetts from before school started freshman year until we graduated. The last six months I was the president of the club. Evelyn preferred to be the club librarian and did about six times the work anyone else in the club did. When we graduated we married, and while I was getting my Masters from Stanford we filled the need for a science fiction club by joining PenSFA, the Peninsula Science Fiction Association, which included such members as artists George Barr and Jim Thomas. When I graduated Stanford I went to work for Burroughs Computer Corporation in Detroit. Wednesday evenings we would go over to Wayne State University and attend the science fiction meetings of the Wayne Third Foundation. We liked the people of that area, but Detroit was depressing and cold. Also, Burroughs was a rather unpleasant place to work. After three and a half years, at the end of 1977, we left and went to work for Bell Laboratories, the research arm of the telephone company. Bell Laboratories was one of the primary scientific research environments in the world, and they treated their employees well. They even funded social clubs for their staff. But nobody had started a science fiction club. This seemed peculiar for a cutting edge research facility. There was a little science fiction activity, but it consisted of one group what shared the cost of a subscription to the Science Fiction Book Club and then they passed the books around by inter-office mail. This was not entirely satisfying. We did go to the Empiricon science fiction convention in November, 1978. On the way home I told Evelyn that we really ought to found a science fiction discussion group at Bell Laboratories. Things were never the same again. By the end of 1978 we had a working science fiction club. Bell would give some minimal funding to the club and we could use company facilities if we could get ten people to say they would join it. At first we thought finding ten people interested would be difficult. That fear was quickly disposed of. We should have been able to call ourselves the “Bell Labs Science Fiction Club”, but that was not allowed by the company so we were just the “Science Fiction Club”. We met every other week and discussed one book and picked another for the following meeting. So two notices had to go out through inter-office mail for each meeting, one to remind people of the coming meeting and one to tell people what book had been chosen for the next meeting. That was a notice a week, and they started hand-written and photocopied, then typed, and eventually e-mailed. A year or so later the meetings were changed for once every three weeks so we would send out two notices every three weeks, but we soon returned to weekly publication. It seemed pointless to just have one item per notice so I started commenting on films and making jokes. Evelyn would write book reviews and other comments and announcements. We at first were based at Bell Laboratories in Holmdel, New Jersey, but members would come to meetings from other nearby Bell Laboratories locations, particularly Lincroft and Middletown. Each of these locations had a two-letter code to make addressing in interoffice mail quick. Holmdel was HO; Middletown was MT; Lincroft was LZ. Why Lincroft was not LC we never found out. The meetings were at whichever facility Evelyn and I were at the time. We were moved around. At a time when we were in Middletown we decided that the club and the notice needed a better name. We could have called ourselves the Middletown-Holmdel-Lincroft Science Fiction Club, but we shortened that using the mail codes to the MT HOLZ. That is not an abbreviation for a mountain’s name, and there appears to be no Mount Holz. Instead it is pronounced as if it were “empty holes.” The weekly notice has was similarly named the MT VOID or pronounced “empty void.” These names were proposed by member Paul S. R. Chisholm. I can’t recall when I myself began subscribing to MT Void. Sometime in the Nineties? Maybe the late Eighties? Anyway, it has given me many years of pleasurable reading, as movie reviews, book reviews, wit, whimsy, and the occasional mathematical puzzle paraded past my eyeballs. I salute Evelyn, Mark, and their correspondents for the remarkable longevity of their creation, and for their efforts in maintaining a high level of entertainment. Long may MT Void wave! This entry was posted in Fanzines and tagged Bill Higgins, Evelyn Leeper, Mark Leeper, MT Void by Mike Glyer. Bookmark the permalink. It’s easy to subscribe to the MT VOID. Click on the issue and get yourself on the mailing list. As far as I know, it still goes through RASF as well, and comments made there are fair game for being published as LoCs. I always give careful consideration to Mark’s recommendations for movies on TCM in the upcoming month, which are sometimes new to me, and other times are welcome confirmations of my excellent taste. This is a wonderful story. Congratulations to those involved. Blessed are the zine makers! Why take the name of a prior fmz from 1955-69, VOID? I suppose the duplication was unavoidable. We didn’t know of VOID, but additionally our name isn’t VOID, but THE. MT VOID (“the empty void”). Two thousand! That’s quite something. Keep ’em coming: I enjoy every ish. Is reading Leepers’ M T VOID.